Without the right data, ABM can’t deliver better ROI. Relying on your customer data alone to simply target lookalike accounts won’t deliver the breakthroughs you require. Growth beyond the level of your historical demand generation success fundamentally depends on access to new types of insight. 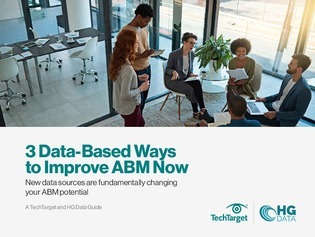 This e-book from TechTarget and HG Data will help you understand new sources of data and how to apply them to drive greater value from your ABM programs.